Initial grant applications are due to the Regional office by July 31, 2018. 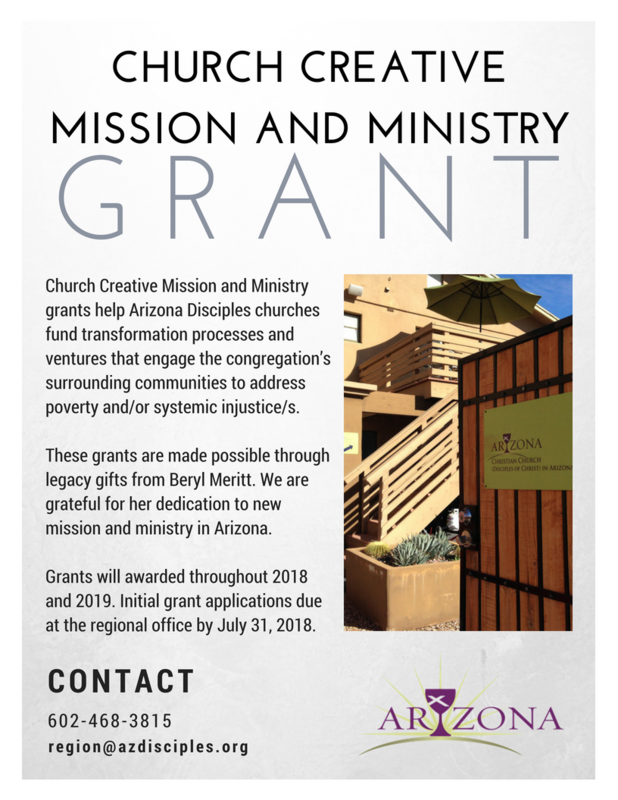 Church Creative Mission and Ministry grants help Arizona Disciples churches fund transformation processes and ventures that engage the congregation’s surrounding communities to address poverty and/or systemic injustice/s. These grants are made possible through legacy gifts from Beryl Meritt. We are grateful for her dedication to new mission and ministry in Arizona. Church Creative Mission and Ministry grants are made to congregations in covenant with the Christian Church (Disciples of Christ) in Arizona. Grants help support Arizona congregations in reaching out to others in creative mission and ministry. These resources are dedicated for new transformational processes, and ventures that engage the congregation in their surrounding communities to address poverty and/or systemic injustice. Church Creative Mission and Ministry grant awards typically do not exceed $2,500 in a one-year period and are often seed funds for new projects. Congregations can submit for subsequent or greater support, to be considered and evaluated by the grant committee. Eligibility for Church Creative Mission and Ministry grants are limited to congregations in covenant with the Christian Church (Disciples of Christ) in Arizona. A detailed description of the proposed program/activity, including a statement about the aims and purposes of the project; a rationale for the project; the target audience/constituency; and statistical or authoritative evidence indicating how the program/activity matches with the stated purposes of the Church Creative Mission and Ministry grant. A detailed program budget showing income and expenses projected for the project, including other identified sources of funding. A summary of how the outcomes will be assessed and measured. A list of staff and other principals who will be involved. A process (financial internal controls) for handling the award. Ministries of the Christian Church in Arizona are all made possible by generous contributions to Disciples Mission Fund and the Arizona Region Annual Fund.